Apple sold 29 million iPhone X units during the holiday quarter, according to a report from analytical firm Canalys. 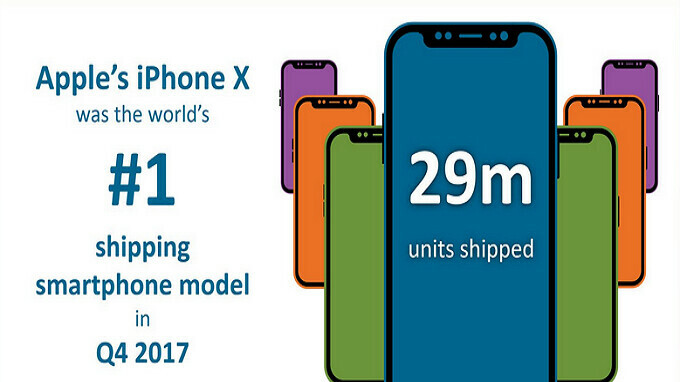 That made the Apple iPhone X the world's number one shipping smartphone model during the three month period from October to the end of December. While that sounds like good news for Apple and its tenth anniversary handset, Canalys analyst Ben Stanton notes that while the figure was impressive for a high priced device, it was below industry expectations. Last week, connected analyst Ming-Chi Kuo of KGI Securities said that he expects Apple to stop production of the iPhone X in the middle of this year due to low sales. According to Canalys, other iPhone models tallied high shipping totals in the quarter, such as the Apple iPhone SE, Apple iPhone 6s, Apple iPhone 7 and the Apple iPhone 8. Older models, like the iPhone 6s and the iPhone 7, are being bought by those who feel that they have discovered value for the money paid. Canalys Analyst TuanAnh Nguyen said that for the fourth quarter, "Apple is looking at its best performance to date, all thanks to the massive changes it made to its portfolio in Q3." Stanton does point out that the big $999 price tag for the 64GB iPhone X, combined with the split launch dates, were some of the reasons why iPhone X shipments failed to hit expectations during the fourth quarter. As Stanton mentions, iPhone X shipments were not the fastest ever for an iPhone. Apple is expected to report its fiscal first quarter earnings on February 1st. On that date, we should know how many iPhone units the company sold during the fourth calendar quarter. Whether Apple breaks out iPhone X sales separately won't be known until the earnings release is disseminated. Let's not forget "Report Claims iPhone X Sales Not as Strong as Expected in the U.S. Poor iPhone X Sales Are Good News For Apple iPhone X sales ‘below’ expectations due to price, says key analyst Analyst suggests customers prefer cheaper iPhones to the iPhone X Apple's combined iPhone X, 8 and 8 Plus uptake still can't beat the 6 and 6 Plus Chinese tech stocks slump after report that Apple has cut its iPhone X orders by 40% The iPhone X order cuts news erase $14 billion off Apple's market cap Interest in Apple's new iPhones near all-time lows at Verizon, AT&T and Sprint What? Ming-Chi Kuo expects Apple to cease production of the iPhone X by mid-2018 due to low demand" Like i said, i wonder where these analysts are when Apple announce their q results next month. 29 million in two months is just incredible number, but it doesn't surprise me. It was released in november, with short supply remember not enough to go around. I think someone is telling porkey pies. No let's not forget that Apple projected original to sell 50M and cut their own estimates to 30M, per PA posted article which we showed you and you denied as even being fact. Don't try to backtrack trying to quote others. It solid not sell as expected, because foe one they couldn t even make enough and for 2, they lowered their own project sales. Now you're trying to deflect as per usual. You were proven wrong. Accept it and move on. Please show a link to a source showing that Apple projected 50 millions. You won’t find one because Apple has never said that. All those numbers have just been speculations from analysts, not Apples own estimates. "No let's not forget that Apple projected original to sell 50M and cut their own estimates to 30M," And again you are doing it, giving a false information. Kuo expected X preorders to be 40 or even 50 million, which had nothing to do with Apple. The number from begin sounded ridiculous. Samsung sold only 29 million S8's within a year. So Apple made roughly 30+ billion in revenue just on the iPhone X in one quarter. iPhone X is the best phone available. Its not even the best iPhone available. Not even close to best overall. iPhone X is easily the best phone available. You may more or less have a point about the iPhone X being the best handset available, but saying "easily" might be quite a stretch. I’m inclined to agree with you. It’s definitely between the s8+ and the iPhone X. Pixel would be up there too if it weren’t for all the issues. I think the iPhone is the best phone available. I don’t know about it easily being the best. I have an S8 plus as well and honestly I’m just waiting for them to build a iMessage/Facetime competitor that works with both sides and ill switch over permanently. The slight difference in app quality isn’t going to make me stay on iOS. Last I looked imessage/facetime don't work on both sides? Google allo and google duo work on everything. You do have to install or have friends install them ,but after the 30 seconds that takes your good to go. They all have strengths and weaknesses but there are usually work arounds. Unless you only use apple and their services, then you are stuck with only iphones. "iPhone X is the best phone available." BAAAAAA LMFAO!!!!!!! How times have changed. I remember when Samsung phones were only "shipped" when they were sold to retailers, and Apple numbers were only "sales". Good times. I know right. But shipped is sold. Because no one is shipping without getting a certain amount of money. Verizon can order 10M phones and .maybe they pay for half upfront. Apple IOS still gonna count all 10M. Just like all preorder are counted as sold even if they don't shop for 8 weeks. But yes we know how they are hypocritical right?! Shipped is not same as sold. Unsold can be returned back to Apple. Which wont be reported to the public. Thats why Apple changed from sold to shipped years back, to not revealed how many actually been sold and how many units been returned back. Remember, this is Canalys' best estimate for the quarter. When February 1st rolls around, we will get the official numbers from Apple (if they care to break it down for us... in the event that they really did sell that many and want to disclose it). What you need to realize is that Apple at the end of the day doesn't care if a $1000 phone sold less than years previous. They are making a bigger profit margin. They are a FOR PROFIT company after all. They are making MORE MONEY by SELLING LESS. All I can say is this, ask anyone under the age of 30, about which phone they would pick. I'm guessing most would say the iPhone X. There isn't a company on the planet willing to report the numerical value of returns to the general public because that's stupid. What good information can be gleamed from those numbers? Report said "shipped", source also said "shipped", and then PhoneArena write "Sold" on title, nice..